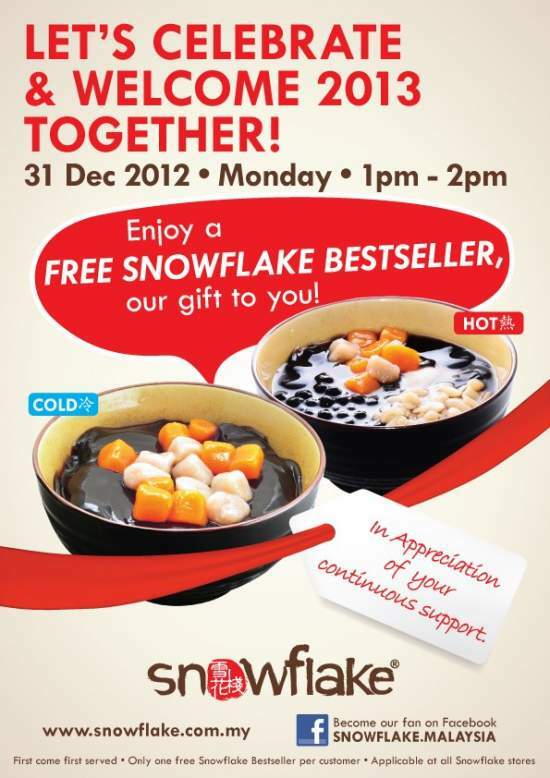 As a token of appreciation and best wishes for next year, come celebrate with Snowflake on 31st December 2012 as they give away FREE Snowflake Bestseller from 1pm - 2pm! SNOWFLAKE is trademarked Taiwanese dessert concept which started off in 2009 and is solely owned by ASIA SNOWFLAKE GROUP SDN. BHD. (831996-P). All our ingredients are then carefully cleaned, cooked for hours (sometimes days) and handmade into our delicious products like Grass Jelly, Soya Ice, Tohua, Taroballs® and our great range of bean toppings.